Tonight was a great night for something special and we had the perfect thing ready to grill – a flank steak that had marinated overnight, much like the one found on allrecipes.com, with just a few minor adjustments. We prepared this fabulous pre-Father’s Day meal tonight for under $30, thanks to Walmart. A glass of Malbec would have been a perfect compliment to this wonderful meal, but we drank that bottle last night. Our Shiraz will just have to do. 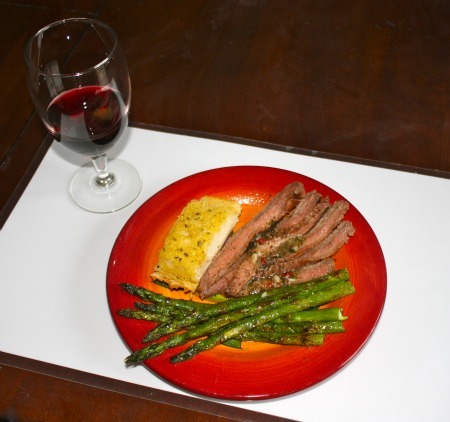 And, of course, no steak is complete without some fresh grilled asparagus and garlic bread, both prepared with the best seasoning ever – Johnny’s Garlic Bread Seasoning. As I mentioned, the flank steak should marinate at least overnight. Be sure you save some of the marinade to drizzle over the grilled steak! Did you prepare a special meal for Father’s Day? Tell me about it! I have been compensated by Walmart, as a Walmart Mom, for my time and efforts to create this post. All thoughts and opinions are my own. I LOVE flank steak. This meal looks so delicious. I also love asparagus. This is making me drool! I may be adding this to my shopping list for tomorrow!